Pulled Wild Boar – Wild game for christmas? Holidays are coming closer! I know some of you are allready dreaming of a smoking Christmas! Who cares if it’s snowing or not as long as the Q is burning we don’t mind. Therefor I will be sharing some delicious Wild Game projects from now on! Carmans NV offered me some nice pieces of meat to experiment with. The wild boar roast is the first in line to share with you! Most of you have smoked quite some Boston Butts. Celebrations ask for something special! 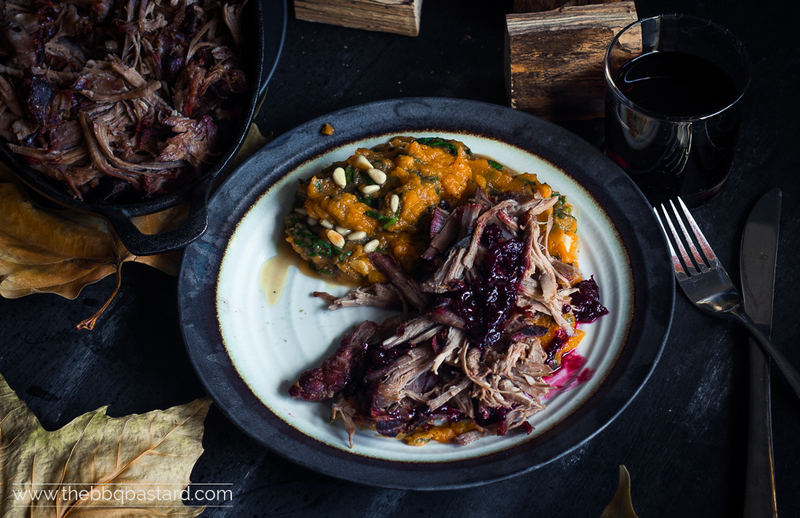 I bet your guests won’t expect the Pulled Wild Boar. Time to blow their minds with your talent. A while ago I got in contact with Nick from Carmans E&L. A belgian family business located in Beringen. Being born between the cattle the Carmans brothers developped a blooming wholesale concern with passion for good food. I heard a lot of good feedback from people who bought their meat over there. Customers more loyal than I had ever seen before praising the customer service. Talking to Nick learned me the same! We agreed terms on a “sponsorship” where Carmans offers me a package of meat and I deliver some recipes in return. Nick told me he would make a package with some interesting pieces of meat. “Something special to experiment with. After all it needs to be a bit of a challenge”. And so he did! The package contains “Venison cheeks, duck breast, wild boar roast, lamb ribs and on my request Iberico Pluma”. With venison steak and a single piece of duck breast being the only wild game projects I made before the challenge is on. I feel like a kid in a candy store right now and couldn’t wait to give it a go. The Pulled wild boar I share with you is the first. But following soon is a dry aged duck breast project I’m working on right now! You don’t want to miss it! The wild boar roast brought me some doubt… Would I play “safe” and go for the traditional Boar roast, form it into game burgers or go for the challenge and try to make “Pulled wild boar” from the piece? Knowing it might be hard to keep it moist. But life is a gamble so I often go for the challenge. To keep the meat moist I used a wet brine before cooking the roast low and slow. One of the advantages of a kamado is the preserved humidity while cooking. When using a different BBQ you might want to add a water pan for this. Last trick I pulled out of my hat was making a tasteful end sauce to mix with the pulled wild boar in the end. Adding just that extra touch of taste and moisture. Actually I have to admit I had a bad night while cooking this lovely piece of Boar. I wasn’t sure how long it would take me to smoke the boar roast so I decided to do an overnight session. Besides I tried the Tom Cococha coco briquettes in my kamado to see how long they would last. Doing things differently than I was used to made me a little unsure. Yet when looking at the graph presented by the I grill 2 I noticed a stable run at 120°C for about 7hrs. So my worries were needless. On the other hand the wild boar didn’t take as long as I thought it would… Therefor I had to come out of my bed at 5.20 on a sunday trying to keep the Pulled wild boar hot and moist for a lot of hours. The end result wasn’t dry but could use some more juices. I mingled the meat juices with the game changer BBQ Sauce and all problems were solved. I could present a very tasteful and festive meal to my family. 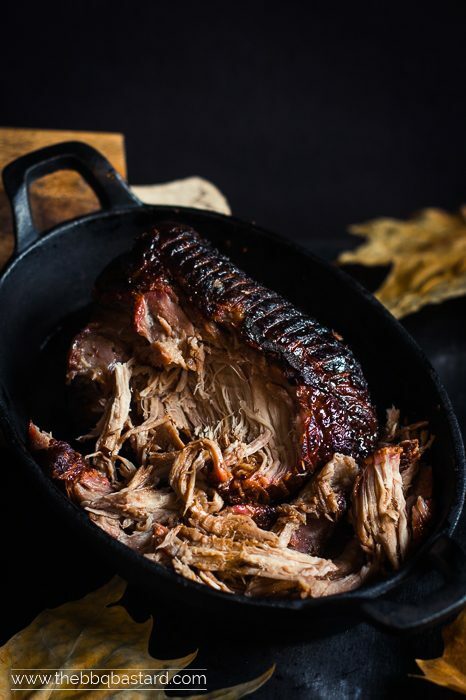 The taste is a lot deeper than regular pulled pork and the end sauce used with this recipe is simply marvelous. Don’t hesitate to share this recipe with your friends and family. You might be eating it for Christmas if you do. Or do you cook yourself those days? Would Pulled wild boar make it to your menu or would you prefer something different? Come tell me all about it! Stop looking for a festive meal for the holidays? You're in the right spot! 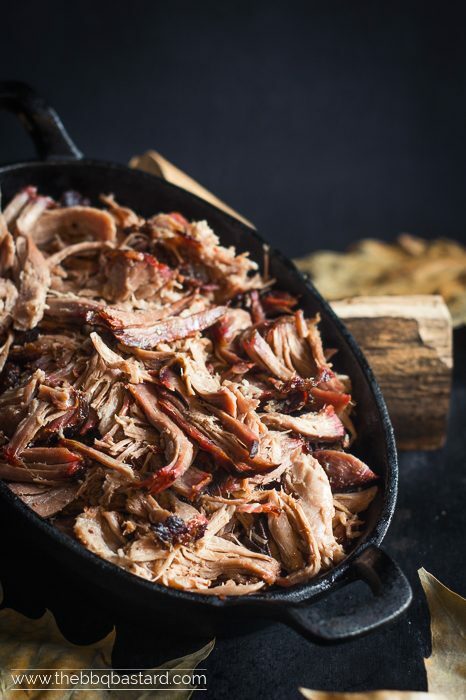 This pulled wild boar is the perfect project to surprise your guests with your BBQ skills! Pulled pork on a higher level. 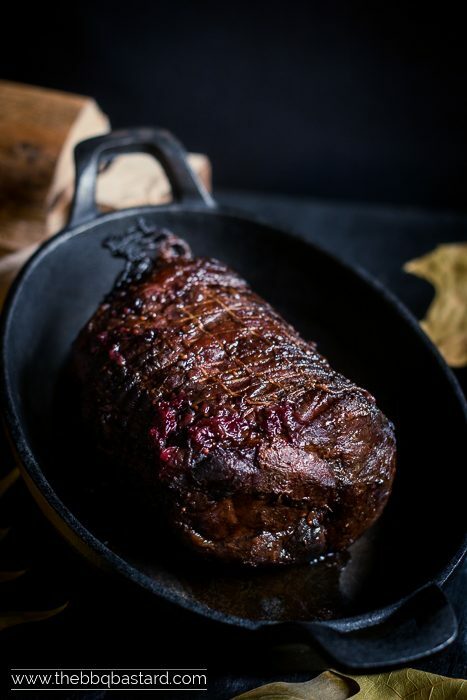 Combine the deep and warm taste of game with the sweet and sour berry port sauce (game changer sauce) and you're set for an unforgettable evening! Take a large pot and heat 2 tbsp. rapeseed oil. Add all ingredients for the marinade except the broth and whisky. Let simmer for about five minutes giving the spices time to release their flavor. Quench with whisky and add the vegetable broth. Let softly cook for about ten minutes. Put the pork roast in a non-reactive container and add the cooled marinade. Put in the fridge for at least 12 hrs. Once the meat is marinated you remove the marinade and pat dry the wild boar. Start your smoker/kamado for indirect cooking at low heat (between 90°C/194°F and 120°C/250°F. Once the fire gets the right temperature toss in 2 chunks of apple wood and wait until the smoke turns slightly blue. 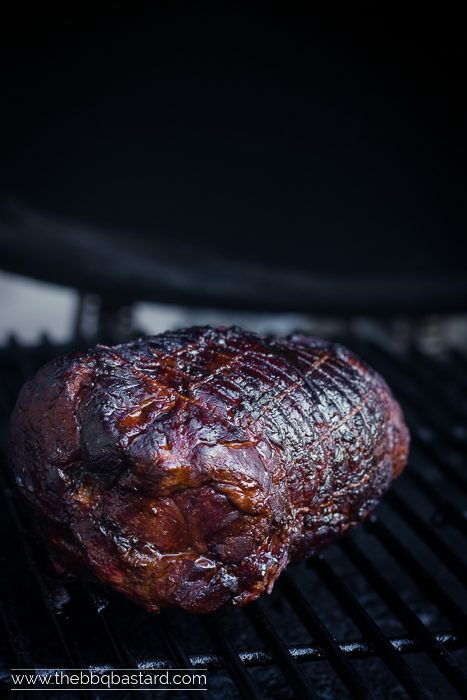 Put the boar roast on the grid and smoke until you get an internal temperature of 94°C/200°F. When using a kamado the environment should be moist enough to keep the meat juicy. You can spray it with whisky if desired (but I was sleeping so I skipped this part ). This is the only moment you open the lid!! If you're looking you ain't cooking. When using a bullet smoker or kettle bbq you need to add a water pan to keep the environment moist. While the meat is smoking you can start making your Game changer BBQ sauce following this recipe. Once the meat hit the right internal temperature remove it from the smoker (mine took 6 hrs.) wrap it gently with butcher paper (in case you can get your hands on it) or tin foil. Let rest for a half hour in a 70°C/160°F oven. Pull the wild boar in strings and add the game changer end sauce. Serve with mashed sweet potatoes, mushrooms and spinach. Have a great festive meal! With my blog I try to share some passion. Some times I get some test products by passionate people or make use of affiliate links to cope with the costs. By buying through these links I earn a small commision without costs for you! All opinions shared are my own and no false statements will be made! - Carmans E&L NV offered the meat used in this post for promotional purpose. No money has been earned for promoting their store. All opinions shared are honest. Homemade bacon – how to cure and dry your own bacon? 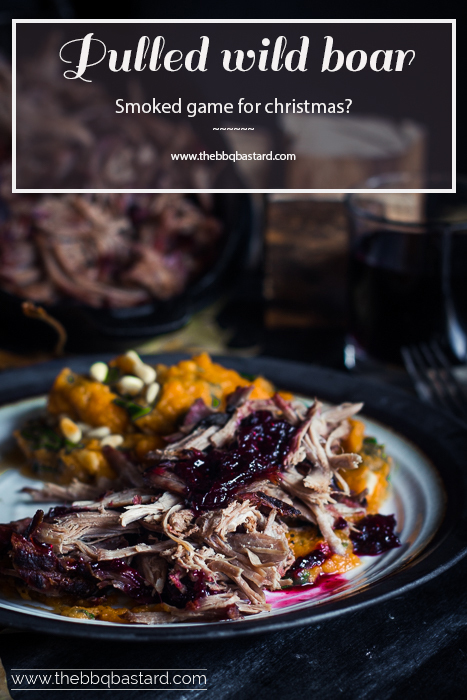 As I’m planning on making pulled wild boar for my whole family on Christmas I found your blog about “PULLED WILD BOAR – WILD GAME FOR CHRISTMAS?”. It sounds amazing and I really want to try to prepare it this way. The problem is that I do not have a smoker or anything similar. So is it also possible to cook it in the oven and do you have any recommendation on how to cook it this way?